@LeedsUtdRyan. It is too soon to be talking about Leeds winning the league or even going up this season after 1 game. We have a good squad and a very good manager but a few more signings and more performances like Sunday’s then maybe we have a chance this season. #lufc #mot. @Russlufc. Wonder what Bielsa has them doing today? Can’t imagine he’s got them in for triple sessions after THAT on Sunday? Surely the man has a heart? #lufc. @JackStannyy. Was thinking when I saw the link to Kalas that not only is he top quality but the full defence song works again. Pontus Jansson, Tomas Kalas, Luke Ayling, Barry Douglas. Written in the stars. @leedsblog1992. 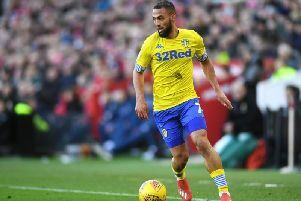 Kemar Roofe is practically the same height as Roberto Firmino and on Sunday he put in a very Firmino-type performance. @brianyoneill. Looking back at the Championship after one game I still find it unbelievable that the English media believe Bielsa is a punt but Lampard with no managerial experience is a certainty to be successful. #LUFC. @reltonml01. Atmosphere on Sunday in @SS5LUFC was something else. Best decision I’ve made is leaving the Kop and moving across. #lufc. @sweet_vxr. Rolling into work like you’re the boss after we destroyed the promotion favourites. #lufc #ALAW.